On the day that Moore published his review, The Sam Wanamaker Playhouse opened its first play, The Duchess of Malfi. Over 100 beeswax candles were lit in the chandeliers and bronze sconces and the 340-seat theatre was filled to capacity as audiences were admitted for the first time. 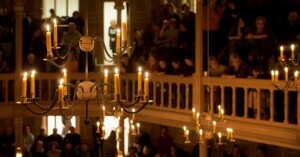 Since then, many more candles have been burned as the newest addition to the ‘Globe complex’ on London’s South Bank has played host to numerous plays, recitals and concerts, each of which have provided a theatrical experience unlike any other. You’d be hard pressed to find a review of the Playhouse that didn’t include the word ‘intimate.’ The space itself is small, with audience members in certain seats within touching distance of the stage itself. The flickering glow of the numerous candles is the only source of light and the space itself is set apart from fluorescent modernity by closed shutters and is in its entirety cocooned within an outer corridor. Certainly it’s hard to imagine a setting where a beeping mobile phone could seem more incongruous, so transporting is the experience. The Globe stage stands at once mere metres and worlds away outside. Thatch roofed and imposing, the Globe is a statement, a timber framed two-fingered salute to the modern world outside and all those who said that it couldn’t be done or that, if it was, it would be little more than ‘tourist tat’. Its more demure younger sibling is, in contrast, a tribute, aptly named for the man who had conceived the notion of the Globe’s reconstruction. 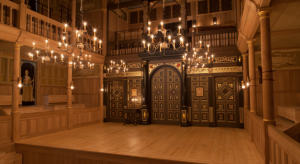 The Playhouse, like the Globe, is based on a theatre that once existed- in this case the Jacobean Blackfriar’s Theatre which in the early 1600s played host to Shakespeare’s company. However, with no plans in existence, merely drawings, the creation of this new space was a labour of imaginative vigour as well as of love. This imagination, the attention to detail and, yes, the oft cited intimacy of the Playhouse rendered it the perfect venue for a series such as Winter’s Tales which combine readings of works from well-known authors with musical interludes. The ‘tales’ chosen are of the kind that one can well imagine being read aloud before a fire as a blizzard rages, and outside the ornate warmth of the theatre’s wooden interior, for all anyone in the audience would have been able to tell it really could have been. 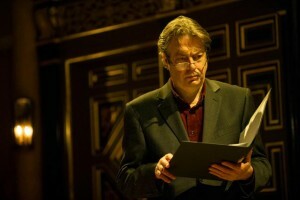 Though I would have dearly loved to have gone to further performances, I was present for just one: readings from D.H Lawrence by Roger Allam. This was Allam’s second show at the Playhouse, following on from The Queen’s Command in the summer. Although, on paper, both occasions might appear to have been ‘readings’ rather than ‘performances,’ in each case the latter description is far more apt. Despite the words being on paper before him, at no point were the audience given the impression that they were merely being read to. Famous for his dulcet tones, anyone remotely acquainted with Allam’s voice couldn’t fail to agree that he would make the instructions for assembling an Ikea shelving unit sound melodic, but with this far more worthy material he was in his element. With never a monotonous moment, Allam’s smooth narration kept the audience- whose expressions were easily discerned in the cosy surroundings- wrapped and attentive. We were also extremely grateful for Lawrence’s fondness for dialogue (and dialect); in Allam’s capable hands the characters, both male and female, came to life with clear individual identities and voices. As they conversed in accents that were not his own, we needed little authorial interjection to know who was speaking and when. We were listening to soap operas with a cast of one, and the experience was as transformative as the setting. Appropriately, transformation and transition were major themes of the individual stories and of the sequence as a whole. In the first tale- The Christening– a family is transformed by a new, and markedly quiet, baby which provides a sharp contrast to the wrecked giant of its querulous grandfather. This is a poignant satire, exposing the destructive power of symbolism even as its title and subject matter, baptism, ought to pertain to its redemptive influence. 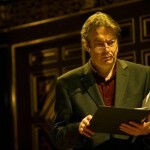 Engaging depth of meaning apart, this story also gave the audience the opportunity to hear Roger Allam perform a regional rendition of ‘pat-a-cake’ which really ought to have been recorded for posterity. The next story, Second Best (or ‘The One With The Moles’) is a coming of age piece in which a couple of furry creatures pay a hefty price for their emblematic part in the protagonist’s journey from innocence into experience, as well as for society’s push towards industrialism. The third and most famous of the three short stories was Odour of Chrysanthemums in which Lawrence deals with the transformative power of death as a woman pores over the body of her husband and ponders the ways in which lack of vitality had changed her perception of him and the role he had played in her life (a subject that Lawrence also deals with in his poem ‘A Woman and Her Dead Husband’). As a triumvirate the stories deal with birth, growing up, death and, as the wife of the dead husband in the last story was pregnant, the additional evidence of rebirth- all set against the backdrop of an increasingly industrialised world. Positioned mid-way between Christmas and the New Year as this particular event was, the se themes of flux and restoration seem extremely seasonally appropriate. Another noteworthy aspect of Winter’s Tales which certainly eased the shift between the stories (and, in truth, deserves a review all to itself) was the music. On the stage alongside Roger Allam appeared noted accordionist Martynas Levickis, whose passionate playing was a delight to hear, his notes managing to incorporate many of the cadences of the written words they followed even if the accordion is not in itself generally associated with Nottinghamshire mining communities. 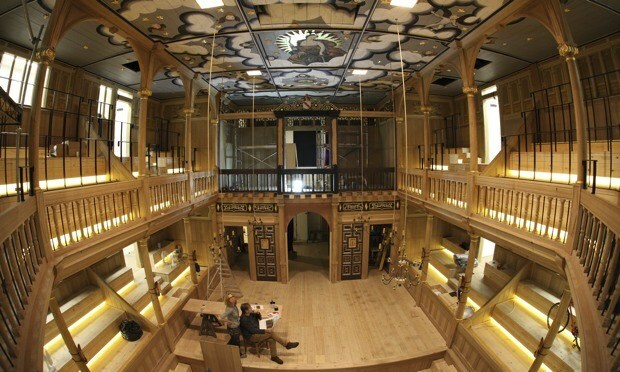 This was a performance that in every way justified Moore’s faith in Shakespeare’s Globe theatres. In the snug surroundings of the Playhouse, the stories came to life one by one until in the final story the closeness lost some of its comfort but gained dramatic effect: the trapped husband’s suffocating fate became our own as, in the confined space, we held our breaths. It was no kitsch festive entertainment, but a serious and thought-provoking afternoon, its merits proven both in artistry and in fabric.